Meg Whitman spoke today at a Morgan Stanley investment conference in San Francisco and, as usual, she had a lot to say. Interviewed by analyst Katie Huberty, Whitman said she thinks that the majority of the “tough decisions” appear to be behind her at HP. “I feel like after 18 months I know what most of the challenges are,” she said. Among those was the decision to undo a directive by her predecessor, Léo Apotheker, to spin out HP’s personal systems group as a separate company, and to take massive write-downs on two prior acquisitions, EDS and Autonomy. Big moves like that are done, she said. What’s not done is the restructuring effort that will reduce HP’s headcount by about 29,000 people, along with the effort to reduce other costs. Whitman said that HP is about halfway through a three-year restructuring and that there are about 15,000 more job cuts to go. But there are also additional cost savings from improved efficiency that can be wrung out of HP’s business. Whitman repeated the story of how HP became the largest customer yet of cloud software giant Salesforce.com, now in use by its 27,000 sales execs. Whitman said that HP had in the past “underinvested in our own IT” around business processes like getting a price quote to customers and quickly closing a sale. “We’re behind our competitors in that, so we have a lot of work to do there,” she said. 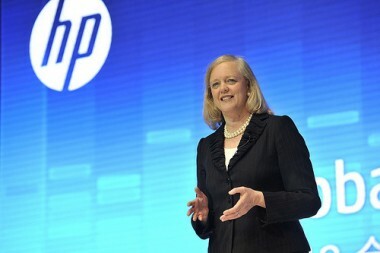 Whitman said that HP is still on track to start showing revenue growth in 2014, even though the world economy is likely to still be on the weaker side. Having boosted research and development spending has helped HP accelerate development of new products like Project Moonshot, a new version of the Proliant server and the Elite 900 tablet — and those products are showing promise, she said. Whitman also took a not-so-veiled shot at Dell, which is in the process of seeking the approval of shareholders to go private. Companies that look less than stable in the eyes of enterprise customers aren’t as likely to close big deals to sell their gear and services. Listen to her characterization below. Asked about the troubled services unit, Whitman expressed confidence in its ability to turn around, even though four major customers are said to be shifting their IT operations in-house. They’re not named in the discussion, but one of them is presumably General Motors. Whitman also explained in detail the meaning behind language found in HP’s most recent 10-K filing with the U.S. Securities and Exchange Commission about the possibility of selling some assets. Many took that to mean that HP might again be mulling the spin-out of its PC division or something like that. It meant nothing of the kind, as Whitman explained in detail.